This is an outstanding log cabin with a unique traditional New England design. If you’re looking for something that will give your garden the wow factor then this is definitely it. There are eight tall glazed windows spread across the front and the sides of the cabin. The double doors also have the same tall glazing, so really this gives more of a 10 window design. You’ll struggle to find a similar sized cabin that gives you such incredible natural lighting as this one. Perhaps the standout feature of the cabin is its double apex roof design. There’s the large, main apex roof which runs front to rear, rather than side to side like most outdoor buildings. Then there’s a smaller apex roof fitted at the front of the cabin, which runs side to side. This contrasting design creates an impressive focal point and allows you to install either an external light or a clock onto the front of the smaller apex roof. With 44mm thick cladding throughout, this is one of the strongest and most durable buildings out there. The doors also come with a very secure lock and key. Everything about this cabin oozes style and elegance. It may come at a high cost, but you’re receiving outstanding value when you take into account the great features included. Very high initial cost though its style, security, versatility and durability mean it provides outstanding value for money. This is a super-impressive, high quality pool house which provides a substantial amount of interior space. 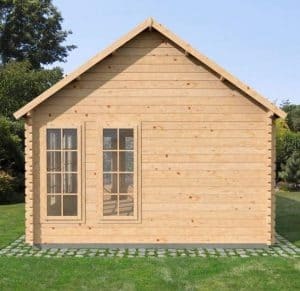 It’s incredibly tough cladding, very strong floor and generous amount of natural lighting also make this cabin suitable for a wide range of uses. You could turn it into a home office, a home gym, or even just use it as it is intended – a place to relax and unwind. Even if you don’t have a pool, this could still provide you with a safe and secure place to forget about your everyday stresses. 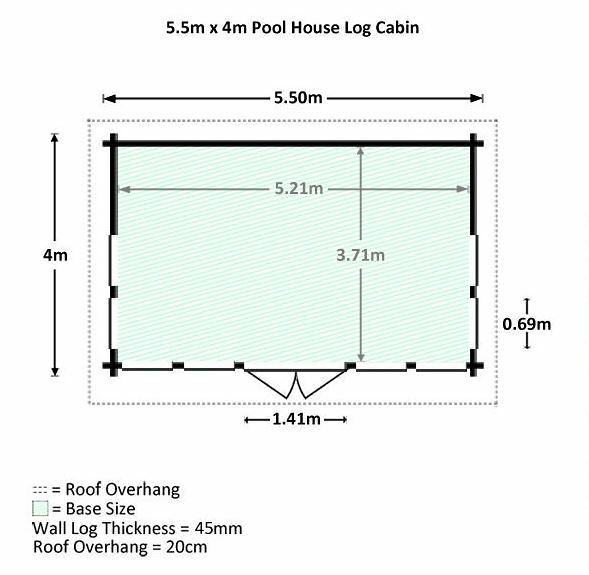 This is a very large cabin and it is highly advised that you take all measurements into account before buying. The height of the roof is particularly large, however it is made to appear taller thanks to the smaller apex roof attached to the front of the main roof. It has a very bold and dramatic design. One of the most useful measurements is the door width. You’ll find on standard buildings, the doors typically tend to measure around 0.75m. 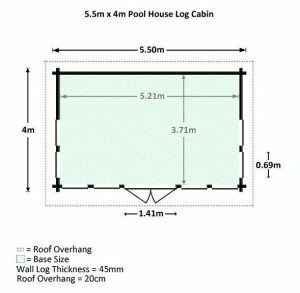 The ones on this pool house measure an outstanding 1.40m, guaranteeing an exceptional amount of access into the building. This makes it very easy to transport large furniture and equipment in and out of the cabin. The roof is the most spectacular part of this pool house. It’s our favourite feature and adds a very unique and stylish design to the cabin. 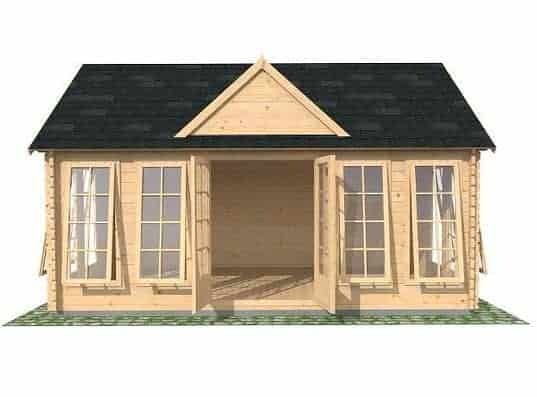 Designed to match the ‘New England’ style houses, this cabins comes with a double roof. So what does this mean? Well, as you can see from the picture, the main apex roof runs in reverse direction. This means it runs diagonally down from the front to the rear of the cabin. It is a unique design in itself as apex roofs tend to run from side to side, like the smaller roof attached to the front of the main roof. What we really like about this smaller roof, is that it provides a small area where you can add design details such as an outdoor clock, lamp or a beautiful hanging basket with flowers. It gives you the chance to really make this cabin your own. Unlike the picture, the roof comes with a heavy duty felt as standard. You do have the option to upgrade to the shingles shown in the picture if you’d prefer, but it will come at a higher cost. Construction wise, the roof is made from 19mm thick tongue and groove cladding. This gives it an extraordinarily strong design. Just like the roof, the floor is also constructed from 19mm thick tongue and groove. You will be able to place even the heaviest of furniture onto this floor without worrying about it crumbling underneath the pressure. It also provides a very sturdy and comfortable feel underfoot. 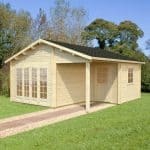 Often you’ll find that log cabins offer you various cladding thicknesses to choose from. This is one of the few on offer from Waltons that doesn’t. That’s because it already comes with one of the thickest types of cladding available. The walls measure an ultra-impressive 44mm thick. No matter what harsh weather it is exposed to, this cabin will ensure that the interior remains dry and safe all year round. The thick timber has a tongue and groove construction, which also gives it a very tight, interlocking style. This prevents drafts and comes with an expansion gap designed to support any alterations in the timber throughout the year. All timber, regardless of how thick, can warp if it encounters extreme changes in moisture or temperature. As the UK weather is so unpredictable, there’s a chance the cladding could swell or shrink. Now as it is so thick, it wouldn’t pose too much of a problem if it were to alter slightly. However, the expansion gap is there as an added precaution to ensure that the actual structure of the cabin remains unaffected. The log panels connect easily together due to this great tongue and groove construction. This makes installation a lot easier. On the panels you’ll see there is a tongue, whilst on the other there is a groove. They quickly and easily connect together. It isn’t just standard tongue and groove construction either. 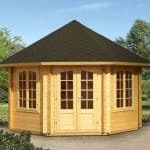 The pool house benefits from Double tongue and groove which basically means it is a lot thicker than standard tongue and groove featured on outdoor buildings. As the cladding is so thick and heavy, it’s logical that a thick, sturdy frame is also needed to support it. Waltons have added an exceptionally thick and strong frame, including very strong roof joists. 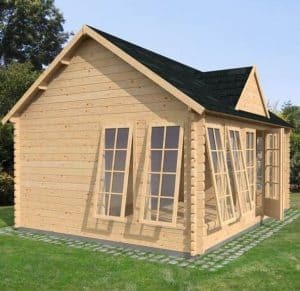 There are also corner joints chalet connections added to ensure extra rigidity and these also provide a very unique and stylish focal point to the cabins exterior. Obviously this is a very robust cabin thanks to the thickness of its logs. However, that doesn’t mean that it doesn’t require treatments. We’re very disappointed that Waltons provide no information on how to treat the building. We’d recommend using a high quality spirit treatment after assembly. This will provide a double layer water resistant barrier and will ensure you benefit from a long-lasting cabin. Spirit treatments are a little more expensive, but they do offer a very deep barrier against harsh weather conditions. How frequently you treat the shed thereafter is entirely up to you. As a general rule we’d advise treating it every couple of years. The good thing about its very thick and strong build is that it doesn’t require frequent treatments. However, like all wood, it will start to become damaged over time if you do not give it some form of protection against the elements. 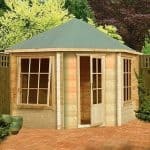 Like with most of their outdoor buildings, Waltons give you a 10 year warranty against rot. Double doors are supplied with the cabin and they have a very wide design. They are glazed with the same Georgian panel style as the windows; dramatically increasing how much light enters the building. Due to their width, they allow you to easily get even the largest equipment and furniture into the cabin without having to struggle, trying to get the right angle. They are fitted with a mortice lock and a very stylish door handle. The windows are one of the main features of this cabin. There are an incredible 8 large windows included on the building. They have a Georgian panel design and they can all be opened which means in the summer months you can get a good amount of air flowing through the interior. This helps with ventilation to stop it feeling ‘stuffy’, making it much more comfortable to work or relax in. The glazing on both the doors and the windows is single glazed as standard. Though you can upgrade to a tougher, double glazed design which will add insulation to the building, as well as make them more difficult to break. A mortice lock on the cabins double doors adds excellent security to the building. This style of lock is actually built into the door, rather than simply attached to its surface. Therefore somebody trying to break in will not be able to remove it. The lock is also secured with a key so this adds to its secure design. The windows can also be locked so you won’t need to worry about anybody getting through them either. Now obviously privacy isn’t something that you benefit from initially. The sheer amount of glazing included on the cabin means absolutely every part of it can be seen from the outside. However, we’d recommend adding curtains, netting or blinds. The strong and thick cladding will support even heavyweight curtains so this would definitely make the cabin more private if this is something that is important to you. It’s extra work and will cost a little more, but the benefits far outweigh the initial inconvenience. You’re given two ways to customise this pool house. The most beneficial is the type of glazing used in the building. Single glazing comes as standard in the cost, but you can opt for double glazing too. The double glazing is incredibly strong and measures 16mm thick. 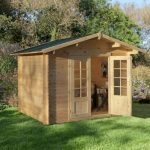 This offers a much higher level of insulation, as well as boosting the security of the shed. Obviously with so many windows supplied with the building, there is the risk that a thief would try to break through. If you upgrade to the double glazing, it will be a lot more difficult for anyone to break in through the windows. Next up is the opportunity to alter the look of the roof. Now as mentioned this is a very unique cabin, largely thanks to its double roof design. As you can clearly see most of the roof, we’d advise upgrading to the Armourshield Shingles. 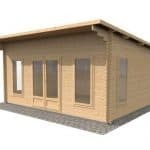 These are shown on the photo of the cabin and they offer a very decorative, attractive design. These ones on offer come in either green or charcoal and they are created with advanced technology. Benefitting from a honeycomb, textured design, they provide a thick layer of protection, just like standard roofing tiles. If you’re looking for the most stylish and durable roof covering, we highly recommend these shingles. Of course, if you don’t wish to spend too much money upgrading the roof, the Superior Duty felt is another option. Again, this comes in green and charcoal colours and it also has a more textured design than the supplied heavy duty felt. Created with fibreglass, it won’t perish and it offers a very high level of protection against the elements. It is worth noting that both the shingles and the Superior Duty felt benefit from self-adhesive installation. A few noteworthy extras are available, though be warned – they come with a pretty high price tag! If you can afford to upgrade however, we’d highly recommend it. The extras below will help you to get the most out of the cabin, increasing its comfort, strength and longevity. The EcoQuilt Garden Building Insulation kits will help to really make the cabin more comfortable throughout those cold, winter months. There are two available including 1 30 and a 60 square metre kit. 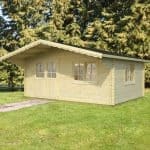 The 60 square metre kit will provide the most insulation, though as the walls of the cabin are 44mm thick, we feel that the 30 square metre option will provide more than enough additional warmth. Both kits comprise of 6 thermal wadding layers and they also contain breather foam and a reflective foil layer. This foil layer provides waterproof protection, ensuring the insulation isn’t affected by moisture. It can be used on the walls, roof and floor of the building and it comes with all necessary tools and instructions. Solar panels could be considered more of an optional upgrade and may not necessarily be needed. Obviously thanks to the amount of windows added to the cabin, lighting isn’t going to be an issue during the day. However, if you want to use the cabin when the sun goes down, it will need some form of lighting. The most obvious way to add light into the cabin would be to install an electrical pack. However, this needs to be wired into the mains and will incur regular running costs. Installation won’t be easy and it isn’t included in the installation service if you plan on taking advantage of that. Another option you have is solar lighting and the kits offered here are incredibly advanced. You’ll notice these panels aren’t exactly cheap. The lowest priced panel kit will set you back £699.95. This is a lot of money to spend considering the high cost of the cabin itself. However, you need to take into account the long term cost saving benefits of the kits. You have five different ones to choose from offering different amounts of power and different installation options. For example, you can choose to have freestanding or roof mounted panels. The power options are also very important to pay attention to. Think about how many things you would like to power at the same time. Will you have a lot of machinery and appliances you would like to use simultaneously or are you simply looking for a light source? The more things you need to power, the stronger kit you will need and the more expensive it will be. We’re blown away by the quality of this pool house. Its standard design is incredible and eliminates the need for upgrades; though by spending a little extra you can boost its insulation and comfort. We don’t often give outdoor buildings 10/10 for longevity, but this cabin is truly built to last. It benefits from incredible 44mm thick cladding which is capable of withstanding even the harshest downpours and strongest winds. 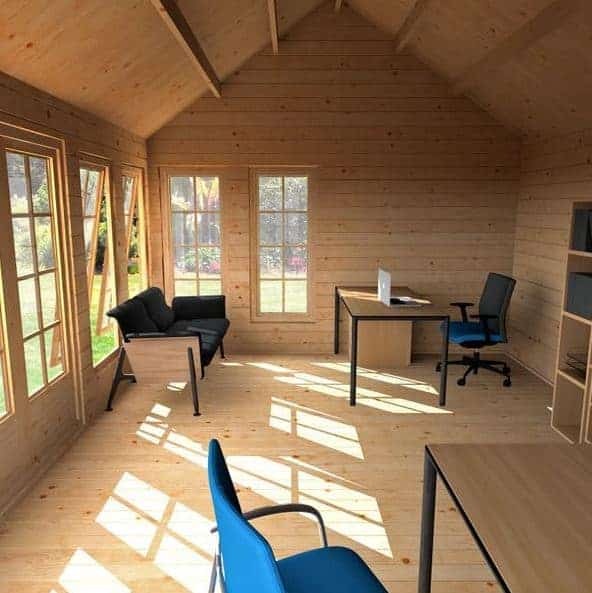 Being such a large cabin, you can use it to store all kinds of things from large sofas to gym equipment and several desks if using as a home office. You have complete flexibility in how you want to use the building and the cladding is strong enough to support even the heaviest shelving. You can probably guess that the installation of this building isn’t going to be quick or simple. It’s an impressive cabin but its great features do pose a few challenges. It also doesn’t help that the instructions provided with the building are fairly basic. However, there is a video available on the Waltons site which shows you how to install it. This makes it much easier. Of course, you will also need to take the time it will take you to assemble it. Don’t expect to complete the installation within 1 day. There is an installation service available, but it does come at a significantly high cost. Though this pool house is super-impressive, we can’t overlook the high cost. It provides some exceptional features that truly do ensure you are getting excellent value for money. However, its initial high cost definitely won’t be attainable for everyone. Final Thoughts: This striking large log cabin looks just like a small house. In fact, it comes with a traditional New England design. The amount of glazing on the building ensures you benefit from maximum natural lighting and its double doors are completely lockable. It is a fantastic pool house, though it could also be used for a wide range of purposes. We particularly like its double apex roof and 44mm thick cladding. Double tongue and groove cladding provides exemplary weather resistance as well as brilliant security. No matter what you choose to use this cabin for, it offers a unique and attractive design that will last for many years.